Astrology News: Mercury Goes Direct at 2 degrees Cancer! 7-7-07: Magickal Day or Hype? Mercury Retrograde Weddings: Voxx explores the future outcome of celebrity weddings during Mercury Retrograde; Eva Longoria and Tony Parker; Nicole Kidman and Keith Urban; Gwen Stefani and Gavin Rossdale; Tom Cruise and Katie Holmes. Live Earth: The hypocrisy of hipster stars. Voxx rips Madonna and other popstars regarding the true cost of the major event. Rituals During Mercury Retrograde: A few reasons why to avoid serious ritual work during this negative aspect. Daily Planets: Sun in Cancer, Moon in Taurus, Mercury in Cancer, Venus in Leo, Mars in Taurus, Jupiter in Sagittarius, Saturn in Leo, Uranus in Pisces, Neptune in Aquarius, Pluto in Sagittarius; Voxx discusses the negative effects of Moon Squaring Venus, Neptune and Saturn. Moon Phases and Marriage: Voxx cautions against marrying during a Waning Moon. Movie Magick: Review of “Ratatouille” and “Transformers”. New Moon in Cancer: What to expect during the upcoming New Moon lunation. Avril Lavigne Publishing Lawsuit: Voxx explores the possible guilt of the popstar in a Tarot reading. 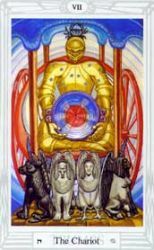 Question: Caller requested info regarding Tarot Spells using the Crowley Thoth Deck. Magickal Orders: The Golden Dawn and the O.T.O. The New Moon in Cancer occurred Saturday morning, July 14th, at 5:04 PDT (8:04 EDT). What a wonderful time this should prove to be, especially for Moonchildren, or those with the Moon in Cancer, or favorable lunar aspects in their Astrology Charts. Although the planet Mercury is finally in direct motion, it has still not reached the degree at which it went retrograde in June, so things may still feel a little unsettled, just try to relax and literally go with the flow. Cancer, Ruler of the 4th House: Cancer is literally the sign of the Home and Family. Therefore, it’s a good time for tinkering around the house and putting things in order. As the New Moon is in a water sign (Cancer), it’s a good time to cleanse and purify your surroundings. Take a Moon bath and let your mind and spirit soak up all that is around you. Since the Moon rules the idea of Family, you will no doubt find yourself going to more picnics, reunions, and events that include the whole crew. You may have some emotional run-ins with annoying relatives so just try to take it in stride! I find it interesting that the two major times of the year when we socialize with close family and friends is during the Summer, when the New Moon occurs in Cancer, and also during Christmas (Hannukah), when the Full Moon occurs in Cancer. As such, since Cancer is the zodiacal sign ruling the stomach, make sure to feed yourself with positive images, and good healthy food. (Cancer also rules the breasts as well, the physiological symbol for nurturing). Tarot Card for Moon in Cancer: The 4 of Cups, the Lord of Luxury. New Moon in Cancer Emotional Trends: For more info as to what to expect during the Moon’s new lunation cycle, register at the Voxx Magickal Forum, and visit the Astrology Section for the New Moon in Cancer post. Today is the anniversary of the 480th Birthday of the well-known, original Enochian Magician, Sir John Dee (the original Agent 007). Sir John Dee was born on July 13th, 1527 and died in 1609. He was primarily known during his life as an expert mathematician and geographer; however, he was also a scholar of the Occult, and an alchemist as well as the Court Astrologer to no less than Queen Elizabeth I. The Virgin Queen most likely owes a great deal to Dee for helping her make important decisions that ultimately cemented her unique place in history as the greatest, most powerful queen since the Egyptian Hatshepsut. 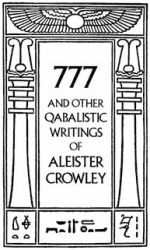 To modern occultists, Dee’s primary legacy is his system of Enochian Magick, which he transcribed by using a Trance Medium (Edward Kelley) as a communicator between man and the Angels. Here are a few links for those of you who might enjoy reading more about this scholar of the divine. As Dee might have said himself, “Ol Sonuf Vaorsagi!” Happy birthday Sir! Caller Number 1: Vanessa (Taurus). Question: What is going to happen now that she’s going to divorce her Scorpio husband? Situation: Newly-separated, she wonders about the near-future outcome of the end of her marriage. Tarot Reading 1: 3 of Swords, 10 of Swords and The Ace of Disks warn to beware against emotional and physical danger. Tarot Reading 2: Princess of Wands, Adjustment (Justice), and the 8 of Cups suggest the decision to legally divorce. Tarot Reading 3: The 2 of Disks shows the husband snooping through her papers and computer files; Prince of Cups shows the husband hanging out at pubs and bars; 4 of Wands indicates the husband will tend to fail at keeping financial promises. Caller Number 2: Christine (May 30). Question: Why is her step-sister (Taurus) acting out so negatively against her father’s remarriage? Situation: Caller’s step-sister is sabotaging her father’s remarriage to the caller’s mother. Tarot Reading: The Tower indicates a psychological need to control an emotionally explosive situation. Jessie Marie Davis: Psychic findings. Caller Number 3: Kevin (Taurus). Question: Will he be forced to move out of his apartment? Situation: A Tarot Reader is harassed into moving after giving ill-advised psychic readings to his Manager (Gemini) and Landlord (Leo). Tarot Reading 1: The Prince of Swords, 3 of Wands and Lust (Strength) show that the Caller needs to plan for a move. Tarot Reading 2: The Hanged Man, 5 of Swords, The Ace of Swords and The Chariot show there’s no way to fix the current situation except to let go and move. Mercury Retrograde in Cancer: Avoiding residential moves during Mercury Retrograde. Caller Number 4: Vanessa’s Husband (Scorpio). Situation: His wife (Caller Number 1), plans to divorce him. Question: What can he expect now that his marriage is finally over? Tarot Reading: 3 of Wands, The Tower, The Knight of Cups and the 8 of Cups indicate he needs to get healing, let go of his marriage and move forward. Caller Number 5: Fran (Libra). Situation: Caller wants to check the status of her current job to one she just interviewed for. Tarot Reading 1: The 2 of Disks, Adjustment (Justice), The Queen of Disks, and the 3 of Wands indicate to stay at her current job for the moment. Tarot Reading 2: The Tower, 7 of Swords and the 10 of Swords indicate that taking the new job would prove to be a disaster.